Chef Matt Johnson studied at the School of Natural Cookery in Colorado where the emphasis is on vegetarian cooking. He returned to the South to be closer to his family and his love for Southern cooking. 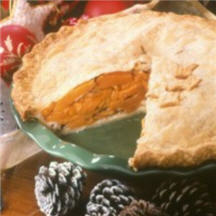 This is his recipe for old-fashioned sliced sweet potato pie, enjoy! Preheat oven to 425°F (220°C) Line a 9-inch pie plate with 1 layer of pastry; set aside. Wash, peel and cut sweet potatoes into 1/4-inch slices. Combine 1 cup of water and the salt into a large saucepan. Add sweet potatoes slices. Cover and bring to a boil over high heat. Reduce heat and simmer until sweet potatoes are just barely tender when pierced, about 5 minutes. Drain slices, then rinse them with cold water until they are cool to touch. Drain slices well; transfer them to a large mixing bowl. Bake in 425°F (220°C). oven until crust is browned and sweet potatoes are tender when pierced, about 50 minutes. (If edges of crust start to brown too quickly, drape lightly with strips of foil. Cool pie on wire rack at least 1 hour. Serve warm or cool. Nutritional Information Per Serving (1/8 of recipe): calories 440; protein 5 g; carbohydrate 75 g; fat 14 g; fat (28% from fat); cholesterol 4 mg; sodium 460 mg; Vitamin A 25,674 IU; fiber 5 g.